First-year student Ruquia Mulamba visits with area employers on Wednesday, Feb. 14, at the Augustana Experience Expo. First-year student Ruquia Mulamba went into Wednesday’s Experience Expo thinking the event would be a good opportunity to network and learn about internship opportunities. She left the event feeling excited after learning about a study abroad opportunity in Cape Town, South Africa, and after visiting with human resource professionals from First Premier Bank in Sioux Falls about summer employment possibilities. Mulamba, a political science/ government and international affairs major from Sioux Falls, was one of hundreds of Augustana students who attended the Experience Expo, an event designed to help students learn about internship and career opportunities, study abroad possibilities and volunteerism. 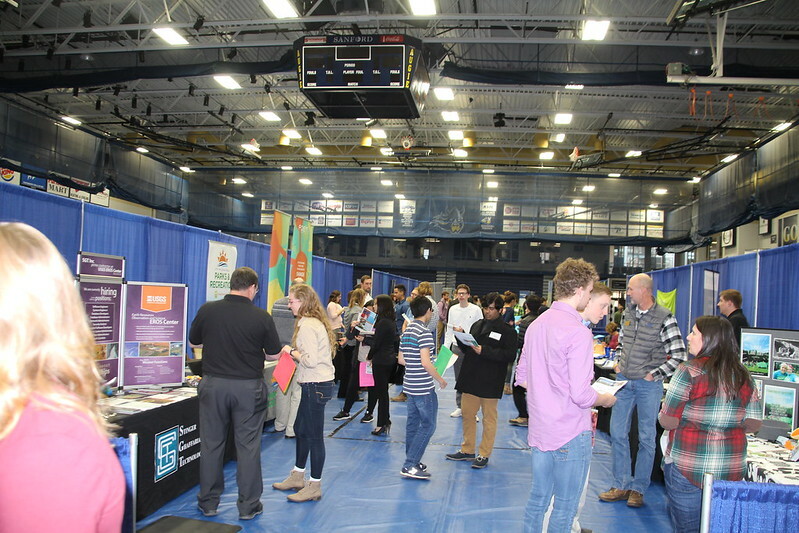 More than 50 area employers were on hand at the event, held in the Elmen Center and sponsored by Augustana's Student Success Center, International Programs Office, the Augustana Student Association and Campus Life. Student organizations and clubs were also present to help student learn about opportunities to be involved on campus. “It’s been a good opportunity to explore all the options that are out there,” Mulamba said. Anna Mitchell, human resource manager at First Premier Bank, said the Expo offered opportunities for students and employers. “It can be intimidating (to begin a conversation with an employer), but the students are doing a good job coming up and they’re asking a lot of good questions,” Mitchell said, explaining that First Premier normally places between 35-45 interns each summer in areas such as compliance, finance, software development and technology. In addition to businesses and nonprofit organizations, camps represent additional summer employment opportunities for college students. Dan Antoine ‘05 is director of programs at Ingham Okoboji Lutheran Bible Camp. He was at the Expo visiting with Augustana students about summer employment opportunities and discussed the valuable skills students can build from working at a camp.